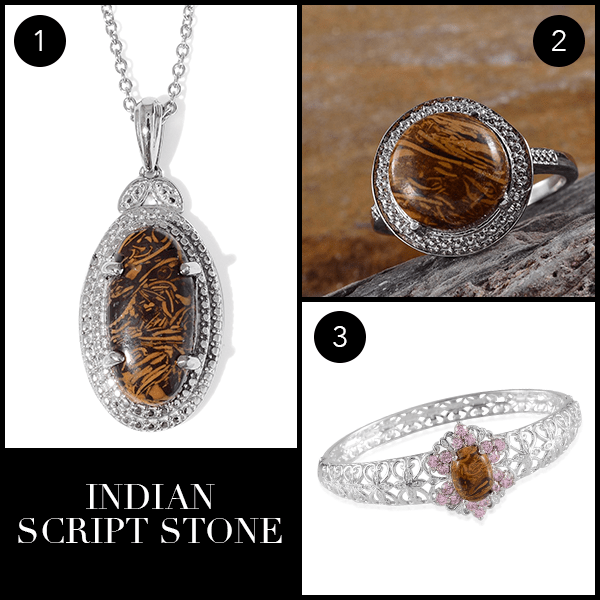 We are so thrilled to introduce you to the LC’s latest rare and exotic gemstone, which is the Indian Script Stone. Continue reading to discover why it’s a must-have for your jewelry collection. Indian script stone is an exquisite gemstone known for its beautiful cursive script like patterns. Its pen-like effect m akes each stone unique and different. Its brown, red, orange and yellow hues contribute to the stone’s beauty and distinctiveness. This gemstone is formed near the shore, where wave action is vigorous and sorts the sediments well. Embedded with shells and/or coral in sedimentary rock, each Indian script stone is unique. Indian Script is not usually treated or enhanced in any way and is known to take an excellent polish. It has a hardness of 6.5-7.0 on the Mohs Scale, but the hardness can vary from stone to stone. Tune into the LC this Wednesday, Aug 12 from 12 p.m. to 8 p.m. CT for these treasures. With our Lowest Price Guarantee and newest Unconditional 30-Day Money-Back Guarantee, you’ll get a great shopping experience at unbeatable prices!